Breakfast is a hard meal for me. Not everyone will eat cereal, you know, the easy breakfast. One kid says the sweeter the better, hardly able to contain her excitement if anything I make contains chocolate, syrup, honey or any other form of sugar. This kid will choke down canned asparagus (triple gross) if bribed with a sweet. Another kid hates to eat anything sweet in the mornings and cannot be bribed as a reward for eating anything she doesn’t like. I have one who pretty much refuses any animal product other then fried chicken nuggets or cheese and that includes eggs. Then there’s my toddler, being raised full-time by a dietitian who has been exposed to more foods than some adults, most likely, however still trying to impress his big sisters and brother. Avery is Andrew’s idol. If she says, “jump”, well… he says, “jump”. If she says “buttonhole”, he says, “buttonhole” (thumbs up Avery) and unfortunately, if she says, “yuck”, so will he. I’m always trying something new. Today I set out to make these fruit parfaits I felt certain all the kids would like. Wouldn’t you know, the sweet tooth commented that the only thing that would make these parfaits better would be to add more sugar. Hmph! Fruit and Almond Butter Parfait 3//4 cup vanilla-flavored organic yogurt 2 Tbsp almond butter local honey for drizzling 3/4 cup sliced organic strawberries, halved organic grapes 3 Tbsp toasted, sliced almonds Whisk yogurt and almond butter until smooth. Lightly toast almonds in a dry skillet. Slice fruit. Layer all ingredients beginning with yogurt mixture, topping each layer of fruit and nuts with a drizzle of honey. I doubled the recipe for six. I have a new appreciation for almond butter and plan to find some new ways to use it. In two Tbsp, there are 6 grams of protein, 3 grams of fiber and only 3 grams of sugar! The fat comes from healthy monounsaturated and polyunsaturated fats. This is a well balanced breakfast with tons of fiber from the almond butter, fresh fruit and toasted, sliced almonds. The yogurt, almonds and almond butter are packed with protein. This is a meal that will really sustain the little monsters until lunch. prescription from a professional: add nuts to pasta dishes, salads, and baked goods. Grab a small handful for a snack to help with weight loss. 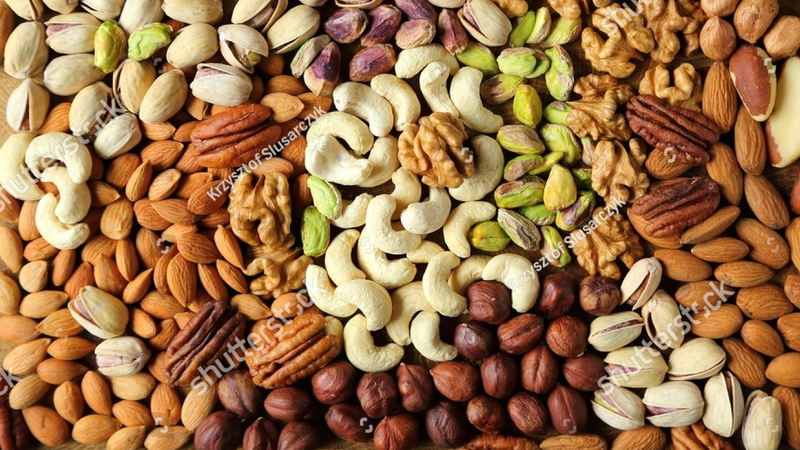 Pine nuts, brazil nuts, pecans, almonds, walnuts, pistachios, and hazelnuts… try them ALL! something you may not know: nuts are an excellent source of protein, healthy fats and fiber. One to two ounces of nuts (about the size of the palm of a women’s hand) gives vitamins and minerals your body needs as well as antioxidant benefits. They have cholesterol-lowering properties and provide satiety. Since nuts are high in calories, be mindful of portions. Related posts: Tuna Melts and Tortillas, #1 Green Chef, Steaks and Shambles, The Best Thing on Sliced Bread Since Sliced Bread, World Famous!, Help Me To Help You! If you feel overwhelmed by all the nutrition advice, calorie recommendations and diet trends, read these: Fact. Not Fad., Let’s Crunch Numbers!, Help Me To Help You!